A compact action RPG from onebitbeyond, The Swords of Ditto is coming to PlayStation 4 and PC in early 2018, Devolver Digital announced today. You can get a look at the gameplay and art style in the above video beginning at 1:09. 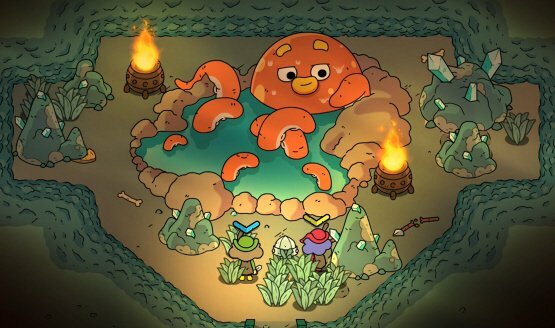 Players will become one of the legendary heroes of the Island of Ditto and battle through each unique legend alone or alongside co-operative companion. Each legend becomes their own as every success and failure are recorded in the tomes of Ditto and have an effect on subsequent adventures. Banish Mormo in one legend and the next generation’s heroes will find a more joyful land, fail and darkness begins to envelope the island. Heroes will also be able to find the monuments and even loot from the adventurers that came before them to take along on their crusade. In development since late 2015, The Swords of Ditto will have its full gameplay reveal on Monday, June 12 at 5pm PT/8pm ET on Twitch. Devolver Digital will be hosting their E3 2017 press conference at 10pm PT on Sunday, June 11 during Twitch’s pre-pre-show. “It’s ridiculous,” Devolver said.